In our first study of Tyndale’s life, we have traced his birth, upbringing, and education at Oxford University. This brought us to the year 1516 and William Tyndale would have been about twenty-two years of age. The activities of Tyndale after the completion of his studies at Oxford are not certain. 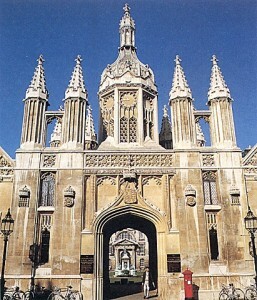 However, on the authority of John Foxe, there is good reason to believe that he studied at Cambridge University for nearly five years. There is no formal record of his matriculation in the University archives; however, as a recent graduate of Oxford, this condition may have been waived. Why should an individual who spent the previous eight years pursuing a university education decide to study at another institution of higher learning? Although we are reduced to conjecture, there were a number of factors that could have influenced him to continue his studies. We know that Erasmus had returned to England and from 1511 to 1514 had taught Greek at Cambridge. Although he would have departed from Cambridge by the time that Tyndale arrived, his influence would remain. If we consider the strong probability that Tyndale was formulating plans to translate and print the Bible in English, an advanced knowledge of the language of the New Testament would be a decided advantage. For that reason alone, we can be confident of Tyndale’s presence at Cambridge lacking any other evidence to the contrary. During the approximately five year period that Tyndale spent at Cambridge, many pivotal events took place, both on the continent and at Cambridge itself. Perhaps the most important was the publication at Basel of the first copy of the New Testament in Greek. After leaving Cambridge, Erasmus gradually worked his way to Basel with the intention of having his Latin translation of the New Testament published. Unknown to him at the time, Johannes Froben, who had taken possession of the Amberbach printing establishment in Basel, had heard that a New Testament in Greek had been printed at Alcala in Spain. Froben correctly surmised that such a book would have a large sale. Because this Greek New Testament was to be part of a Biblical polyglot, known as the Complutensian, the New Testament was not published, i. e. offered for sale until the Old Testament portion was completed. However, Froben knew that it would not be long before the Old Testament would be finished and he wished to have a Greek New Testament printed and published before the Complutensian was ready. We are told that he made an agreement with Erasmus to print his Latin translation in return for Erasmus’ editorial work on the Greek text. The texts were to be printed side by side in a single volume. 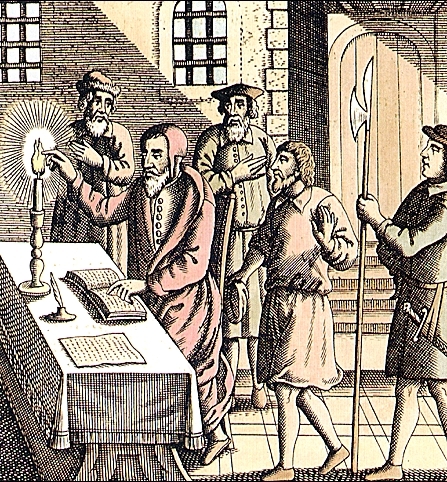 It required a great deal of courage to print a Latin translation that was not the Vulgate. For by this time in history, the Vulgate translation by Jerome was considered nearly infallible. Erasmus agreed to the arrangement and set to work collecting Greek manuscripts. We do not have the space to relate the printing of what came to be known as the Novum Instrumentum; the first printed and published Greek New Testament. However, it was finished in 1516 and was an immediate best seller. The Greek New Testament, in its second edition known as the Novum Testamentum, had made a profound impact on the life of a young Augustinian monk in Wittenburg, Germany. That individual was Martin Luther, Professor of Biblical Studies at the University, who was in the throes of a great spiritual crisis. In his preparatory studies for teaching, he had encountered the phrase the righteousness of God in both the book of Psalms and Romans. Luther related how the phrase terrified him because he knew that he could never attain to such a standard in order to gain God’s acceptance. However, through the ministry of the Holy Spirit and the diligent study of the Word of God, especially the Greek New Testament, Luther underwent what he called his “tower experience” in which he came to understand that the righteousness of God was not an impossible standard that he could never reach, but was God’s free gift in Christ and received by faith alone. Luther later remarked that when this truth entered his soul, he felt that he had entered the gates of Paradise. That same book, the Greek New Testament, contributed to a third significant event. It took place at Cambridge when a young scholar at Trinity College underwent a similar spiritual struggle as Luther. His name was Thomas Bilney and in many ways we can credit the beginning of the Reformation in both Cambridge and England to him. Distressed at his inability to find spiritual peace, Bilney violated one of the rules of his university. The Greek New Testament had been banned by the university officials; no scholar or student was permitted to own a copy. However, Bilney slipped out of his rooms one evening and purchased a copy secretly. He brought it back to his room and began to read it. He continued to read throughout the night until he came to I Timothy 1:15 where Paul stated that Christ Jesus came into the world to save sinners of whom he was chief. When Bilney read those words, he was converted. Not very many people come to the knowledge of Christ as Saviour through the reading of the Greek New Testament but such a person was Thomas Bilney. Bilney was unable to keep secret what had taken place to him. 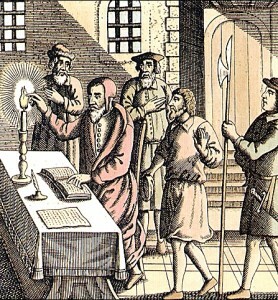 He shared the fact of his conversion to Hugh Latimer in a “confession” and Latimer was converted. At that time Latimer was considered to be the foremost preacher in all of England although he was very conservative. In the event, a group of students from the various colleges of Cambridge began to meet together to discuss the events that were taking place in Germany and the need for reformation in England as well. In addition to Bilney, Latimer, and many others who would figure prominently in the English reformation, was William Tyndale. The company met after classes in a room located at the White Horse Inn. Within a short time, the White Horse Inn received another name. It was called “Little Germany” because of what was discussed among the students. There is good reason to believe that the doctrinal aspect of the English Reformation began in the White Horse Inn. There was abundant evidence that the Church of England stood in need of such a reformation that was being carried out in Germany. We do not have access to any records that reveal the conversations that took place in the White Horse Inn, but there is little doubt that the students shared their ideas of how such a reformation could be accomplished in England. It would be fascinating to learn, at the distance we live from the event, what contribution William Tyndale would have made to the conversation. Again, we are reduced to conjecture but there is little doubt that he would have noted the connection between the printing of God’s Word in its original language and subsequent events in the life of both Luther and Bilney. What occurred in the lives of those two individuals needed to be carried out in the lives of the English people, but relatively few were scholars and had access to the Greek New Testament. How imperative it was that the Greek New Testament be translated in the language of the people and be distributed to the masses. The key to reformation was in the Word of God but the Word of God had to be translated into the vernacular language. But how was Tyndale going to accomplish this goal? We will note his next steps in the third installment of his life.